« Illustrating Aesop’s Fables For Today’s Children. 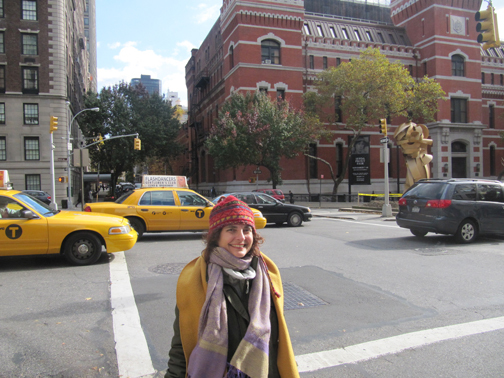 Talleen in front of the Park Avenue Armory. 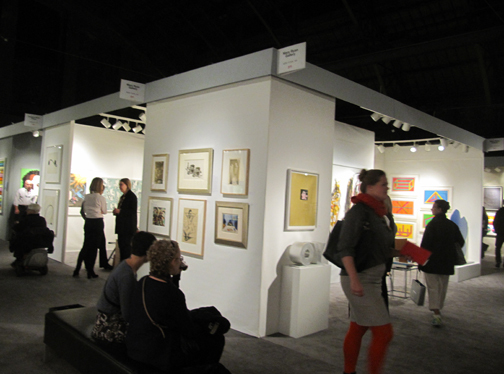 The International Fine Print Dealers Association (IFPDA) Print Fair is a must-see for printmakers and art enthusiasts. This is why I made made a beeline from Montreal to to the Park Avenue Armory in New York City. Twenty fellow artists from three different printmaking studios in Quebec, as well as six artists from Brooklyn, New Jersey and Pennsylvania joined me to share this spectacular print extravaganza. A visit to the IFPDA Print Fair is an extreme pleasure trip that takes you from 16th century engravings to hot-off-the-press prints by today’s leading international artists. This twenty-third edition of the annual Print Fair is the crown jewel of New York Print Week. It features 90 dealers; 63 from North America and 27 from Europe. Each booth, whether featuring work by old masters such as Rembrandt, Dürer and Goltzius or new editions by prominent contemporary artists such as Tauba Aurbac, Olaffur Eliasson, and Damien Hirst, offered a unique window into the rich world of printmaking. The juxtaposition of period and movement creates an interesting rhythm that enhances the viewing experience. It was pure pleasure to hear David Tunick’s presentation at David Tunick Inc. 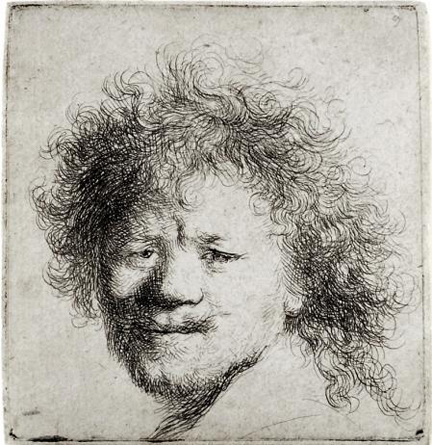 He highlighted Rembrandt’s Self Portrait with Long Bushy Hair. This etching is the third of of thirty states, that are prints that record the evolution of an image. Tunick explained how Rembrandt would add a detail, such two or three strands of hair, before printing a new state, practically using the copper plate as a sketch pad. I also liked Tunick’s presentation of Matisse’s artist’s book, Jazz. 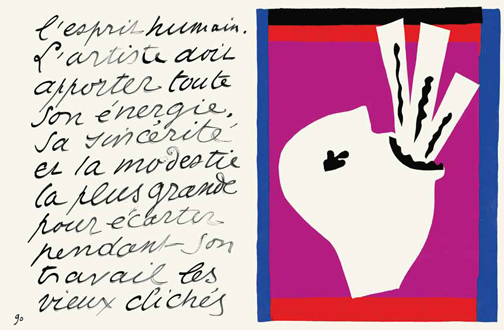 This delightful leather bound book, features Matisse’s bold cut-out designs as well as his handwriting that dances off the pages. Yoko Ono recently bought this book. I was thrilled to discover Steven Ford’s work at Dolan Maxwell. Ford deftly combines several techniques to make his large prints. 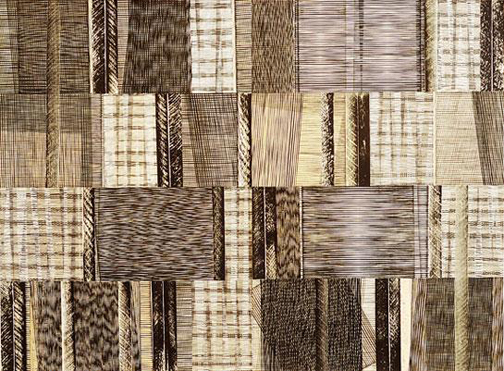 Linear patterns, reminiscent of woven textures, create intricately composed surfaces. David Hockney is always a delight. I was drawn to his Office Chair, presented by Leslie Sacks Contemporary. Hockney’s technique, color copier printing, is particularly in sync with the subject matter. 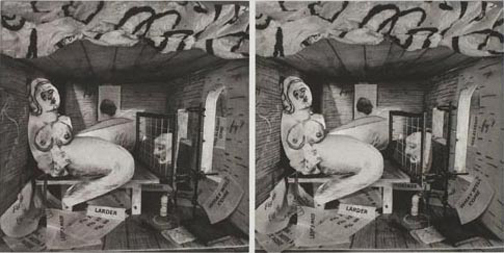 William Kentridge, Etant donnée, photogravure, stereogravure, 2007. The Fair always provides a glimpse into more obscure printmaking techniques. South African artist, William Kentridge is showing stereogravures. I was primarily attracted to his prints at Robert Brown Gallery for their whimsical imagery. It was fun to discover that these double images were conceived to be viewed through a stereoscope for a three dimensional effect. The gallery owner assured me that each purchased print is accompanied with a snazzy red stereoscope that folds into a palm-sized box. Louise Bourgeois, Crochet 11, Mixografia, 1998. Speaking of technique, it is always a thrill to visit Mixografia’s booth. The Mixografia technique is a fine art printing process that allows for the production of three-dimensional prints with texture and fine surface detail. Mixografia evolved in Mexico City in response to Rufino Tamayo’s work. In 1983 the Mixografia workshop expanded to Los Angeles. 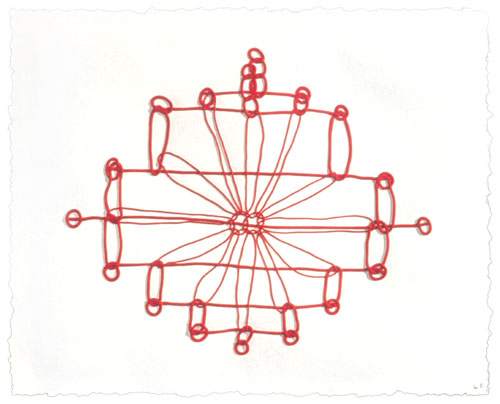 I was drawn to Crochet II, by Louise Bourgeois. The highly embossed mandala-like pattern let me reflect on the relationship between women and needlework. The blood- red lines, reminiscent of veins, also made me think of how our lives, like our bodies, are constructed of intricate vital networks. The larger prints tended to be displayed on outside walls and one that caught my eye was Stormy Weather, by British artist, Howard Hodgkin. 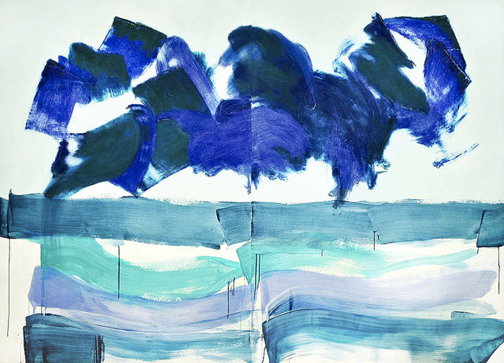 I was drawn to the power of his broad gestural brushstrokes and his restrained yet sumptuous palette of blues. During my visit I kept bumping into my printmaker friends, each more enthused than the other, several bringing me to his or her favorite print. That afternoon, perusing aisle after aisle of captivating prints and sharing the experience with fellow artists I realized that the IFPDA Print Fair is my best excuse to visit New York, not that I ever need an excuse!